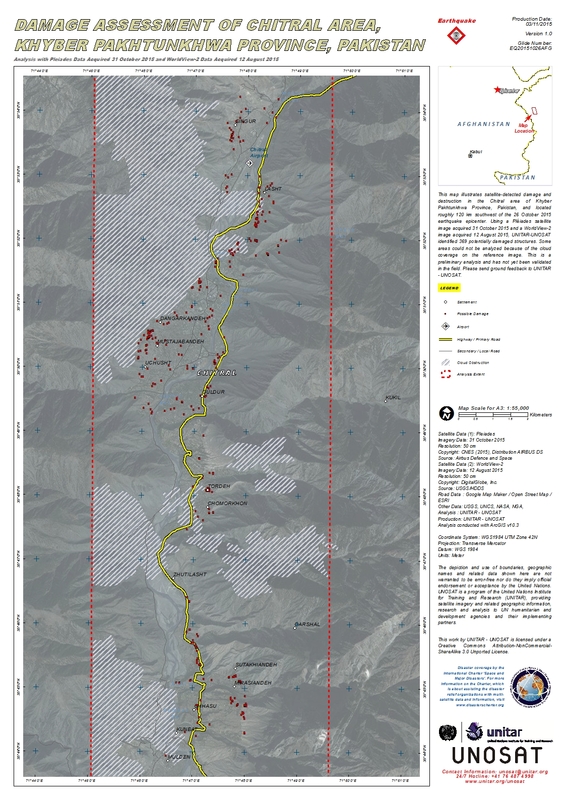 This map illustrates satellite-detected damage and destruction in the Chitral area of Khyber Pakhtunkhwa Province, Pakistan, and located roughly 120 km southwest of the 26 October 2015 earthquake epicenter. Using a Pléiades satellite image acquired 31 October 2015 and a WorldView-2 image acquired 12 August 2015, UNITAR/UNOSAT identified 369 potentially damaged structures. Some areas could not be analyzed because of the cloud coverage on the reference image. This is a preliminary analysis and has not yet been validated in the field. Please send ground feedback to UNITAR/UNOSAT.